Knitted Brain Slug [free pattern] - Creativity Strikes! Every now and then I browse around for free knitting patterns and every now and then I strike gold. I’ve never made a toy before, nor knit anything needing stuffing (actually that’s not entirely true). And I’ve especially never followed a pattern so exactly. But… well it’s a knitted brain slug! Brain slugs are small, one-eyed, vaguely sluglike aliens who attach themselves to the people’s heads to control them. Brain slugs apparently use this as a method of trapping more “prey,” since those under brain slug control are driven by the desire to place brain slugs on other beings. The brain slug can be seen in numerous Futurama episodes . Not only was it a fun-looking project, but I had three other reasons for taking it on. There was a stitch in the pattern I didn’t know! Well, the project went so well I actually made two brain slugs and they’re both long gone so I’m glad I had the wherewithal to take at least one photo of my handiwork. I might want to work on my stuffing abilities next time, and the eye is a bit big, but I won’t be too self-critical. It was really fun and easy. That said, here’s the Brain Slug pattern I used. 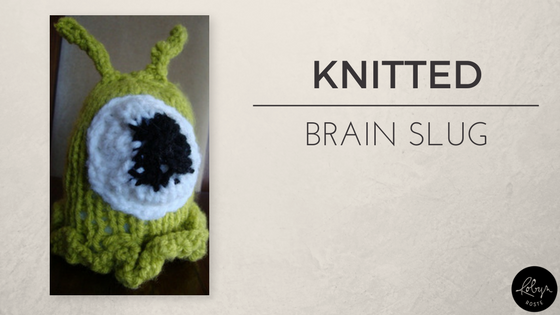 You know, just in case you’re curious and would like a knitted brain slug of your own.